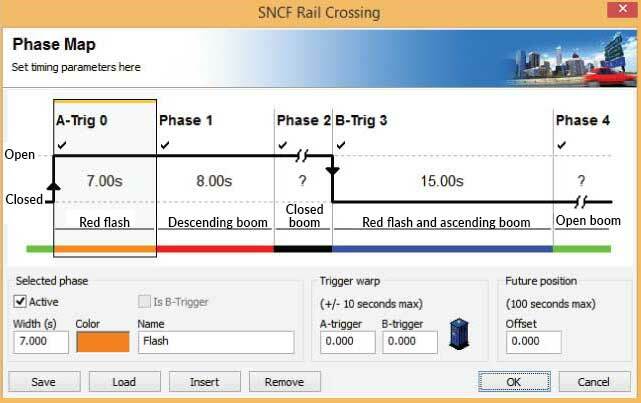 To improve safety, the French Railways company (SNCF) is recording driver behaviour at level crossings. After investigating options for recording data, they have opted for the unique RoadPod® Phase T system. Once analysed, this data would allow them to identify safety risks by visualising the traffic violations during alert signal phases. SNCF utilised several RoadPod® Phase T units to capture this information. 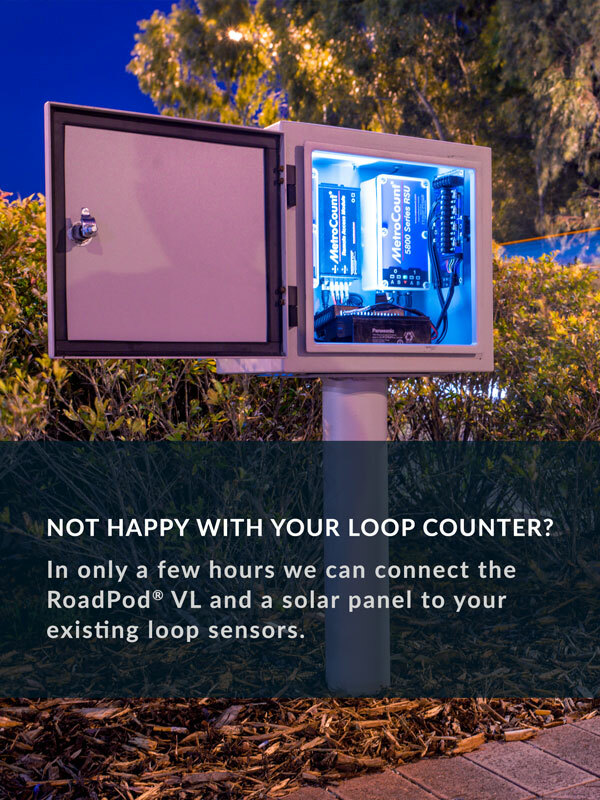 This revolutionary technology incorporates sensors connected to traffic lights or/and flashing boom gate systems. This synchronisation between the signals and traffic enables a clear representation of road activity including speeds and volumes as the warning signals are active. 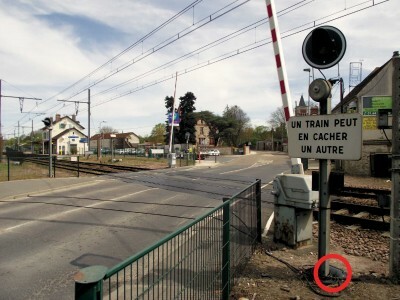 In 2014, SNCF conducted a study in the town of Maisse, connecting the counter to the boom gates adjacent to the local train station. In this contexts, analysing driver behaviour requires the definition of signal timing sequences. The user does this in MTE™ by building a Phase Map, where phases are specified (e.g. descending boom, closed boom, open boom, red flash alert), and their durations are defined in seconds. This process sets the synchronisation between the counter and the traffic signals, and can be modified post traffic survey. 43 drivers crossed during the Descending Boom phase, and 2,871 started to traverse the pneumatic tubes during the Red Flash and Ascending Boom phase. 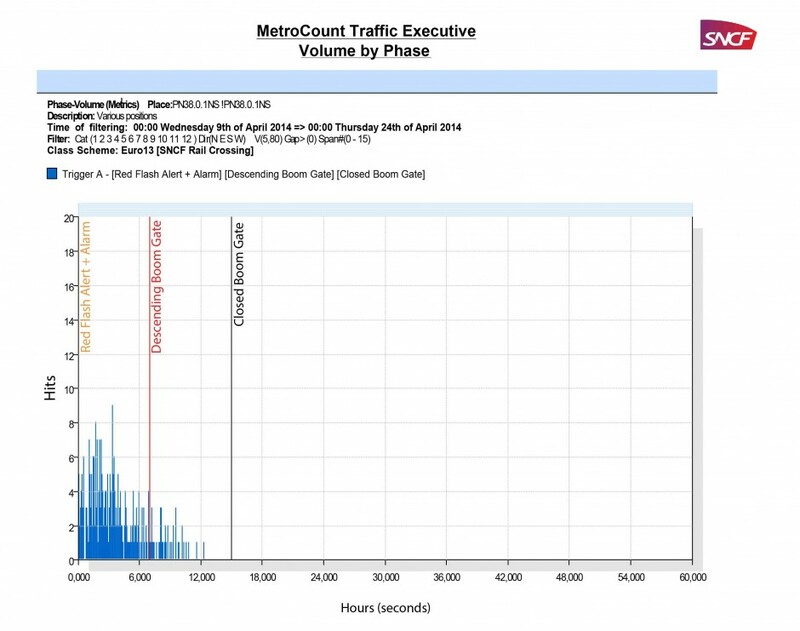 After two weeks of data collection, a Class Speed Matrix revealed that 90,000 vehicles had traversed the rail crossing, of which 3,803 (4,24%) were speeding. In an area where the posted speed limited is 50km/h, the highest recorded speed was 80km/h, and the 85th percentile speed was recorded at 43.9 km/h. Out of the speeding vehicles, over 99% were ordinary cars while 6 were heavy vehicles. The Phase Statistics report revealed 317 vehicles crossing the railways during the Red-Flash Alert + Alarm phase. 43 drivers crossed during the Descending Boom phase, and 2,871 started to traverse the pneumatic tubes during the Red Flash and Ascending Boom phase when the gates were rising but the red lights and the alarm were still on. 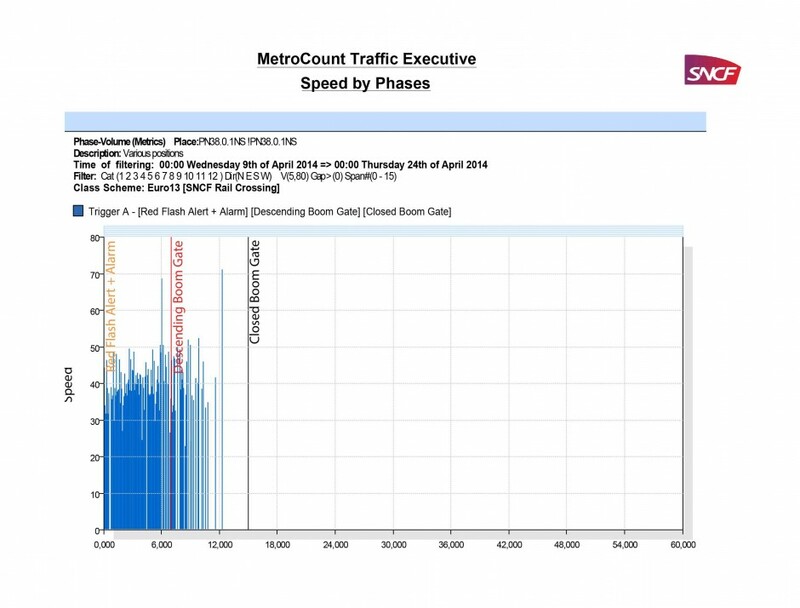 The Volume by Phase and Speed by Phase reports below show the data behind these findings. After a successful first test in Maisse, SNCF has acquired more units to monitor traffic across around railways in Ectot-lès-Baons, Gonfreville, Motteville and Yvetot. To see the full SNCF report of this study (in French), please click here.